Singapore's top athletes were honoured for their record-breaking SEA Games achievements, as a total of $1 million was given out under the Multi-Million Dollar Award Programme (MAP) at an award presentation ceremony at Orchard Hotel last night. It was the largest sum ever handed out to the gold medallists in a single edition of the biennial Games, with many of the 183 champion athletes receiving multiple cash awards. 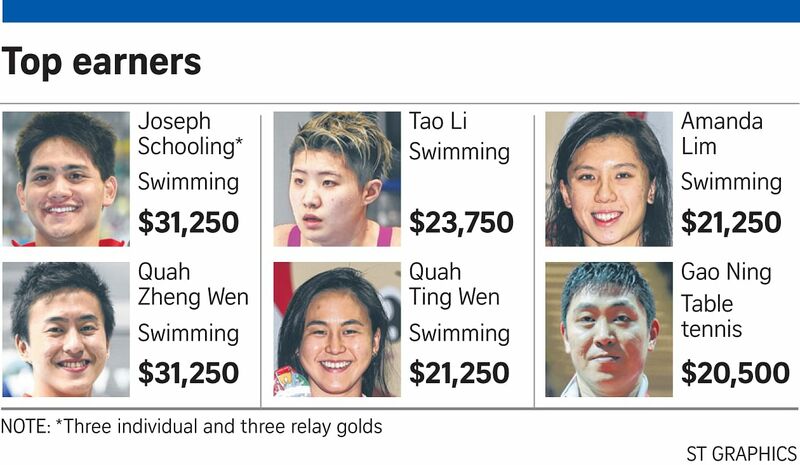 Swimmer Joseph Schooling was joint top earner together with teammate Quah Zheng Wen, each pocketing $31,250 for their feats. This is the third straight time that Schooling has emerged as the top earner at this award ceremony, having also posted stellar performances at the 2013 Myanmar SEA Games and last year's Commonwealth Games and Asian Games. However, as he is based in the United States, this is the first time the University of Texas undergraduate has been able to collect his cash prizes in person. The 20-year-old, who won all of the nine events he entered at the SEA Games, is in town for the Fina World Junior Swimming Championships as the local ambassador of the world swim meet. Despite jetlag and a jam-packed schedule, the newly minted world championships bronze medallist cut a relaxed figure yesterday. He has been taking a two-week break before diving back into intensive training and school next week. Said Schooling, who flies back to Austin on Saturday: "This is the first time in many years that I've been able to travel home or somewhere without worrying about racing. "It's a nice feeling. I'm having a lot of fun, just relaxing and seeing everyone again." The swimmers, traditionally Team Singapore's top performers at the SEA Games, were again the biggest winners of the night. Tao Li was the top female earner and was rewarded with $23,750, while her teammates Amanda Lim and Quah Ting Wen were given $21,250 each. Table tennis player Gao Ning is the biggest earner who is not a swimmer, receiving $20,500. Minister for Social and Family Development Tan Chuan-Jin, who is also president of the Singapore National Olympic Council, commended the athletes for their results, while also encouraging them to continue to "push boundaries" at future major events. "We could not have asked for a better Games," said Mr Tan, referring to Team Singapore's historic haul of 84 golds, 73 silvers and 102 bronzes. "We've seen new milestones set by our athletes such as Joseph Schooling and Quah Zheng Wen since the SEA Games... I hope it inspires more athletes to aspire to greater things." The MAP award is a cash incentive scheme sponsored by the Tote Board and Singapore Pools. Champions at the SEA Games are rewarded up to a maximum of three individual golds, receiving $10,000 for the first gold and $5,000 for the second and third golds. Team-event winners are awarded $15,000 while team-sports champions are given $30,000. Athletes are required to plough back 20 per cent of their earnings to their respective national sport associations for training and development.